mon Anhof : Which country does the most good for the world? 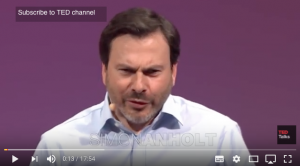 Simon Anhof, Policy advisor for many governments, produced one of the ‘goodest’ (not a spelling mistake, you’ll understand) TedlTalk I saw, « Which country does the most good for the world? » presenting his ‘Good Country Index’. For him, a ‘good’ country is not (only) looking inwards to make their people richer or happier (in a ‘seflfish’ way), but outwards, caring to do good to its neighbors and the world. So Simon Anhof collected data on the good things they are doing and the image of the country seen from outside. The result show a surprising ‘goodest’ country in the world (not the ‘best’, which has a different meaning), but I won’t spoil the video 😉 I’ll only say that it is not France, but it does quite nicely … And I hope this will be improved in the future. Only one regret : he does not mention … Europe ! Join us in the LinkedIn group Valeur(s) & Management to discuss this and build a ‘gooder’ world, at a country but also town, company, job … levels !